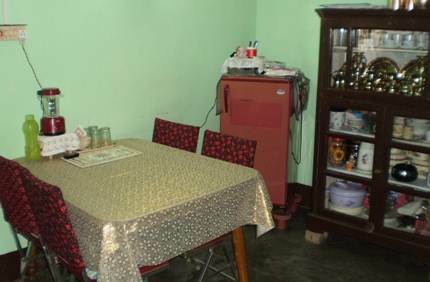 This is a family run small homestay located at Singell Tea Estate in Kurseong and overlooking the beautiful tea garden. From Kurseong station or market area, it's less than 10 minutes drive. You can actually see the bright blue colored small building from the main road. It looks hanging from a cliff. A narrow downhill lane from the main road leads to the homestay. It's only a 2-minute walk up to the main road. Lathika and Aruna are your hosts. While Lathika takes care of all in-house activities, Aruna takes care of all communications with guests. But both are great cooks and will cook delicious Nepali food for you. As you enter through the gate, you actually stand on the open roof of the building. The floors are at lower level. The owners family stay at the first lower level. This is where you will be invited to take your meals in the common dining area. You get a chance to mix with the wonderful family and understand the local Nepali culture. From the dining area you can see the small kitchen where Lathika spends most of her time. There is also a family living room which guests too can use. There are three guest rooms at the second lower level and all in a row with a nice common balcony. Two are double bedded rooms and the third can accommodate 4 persons. But the bigger room doesn't have an attached toilet. However it does have a nice private toilet at the end of the balcony. Rooms are basic and clean. Toilets are of western style. You will get hot water whenever you want. Not all rooms have TVs. But you can always go to the family living room upstairs and watch TV. Lathika and Aruna will cook great Nepali food. Note that on Tuesdays they offer only vegetarian food. On other days, all kinds of non-vegetarian items can be prepared including chicken, mutton, eggs etc. They can also prepare beef if you like. View from the balcony is awesome. Straight ahead you see the vast landscape of the Singell tea garden and the estate. Towards left you can see the main road far away and the toy train going towards Darjeeling or returning. You can walk down to the Tea garden below. But walking up can be cumbersome. Ask Aruna and she will arrange a car for you at reasonable cost. They don't take any cut on transport or tours. The homestay guests are allowed to visit the tea estate factory, take an internal tour and watch tea processing and plucking. Update October 2016: They have now extended their homestay. A double-bedroom with attached bathroom and a private small balcony has been built upstairs where cars used to park. This is specially keeping in mind retired and elderly couples who cannot negotiate stairs. Room service and laundry are available for them. Another single bedroom with attached bathroom has also come up. 1) Although very small, this is a great budget option in Kurseong. 2) It's ideal for those who want to stay a bit away from the crowded area. 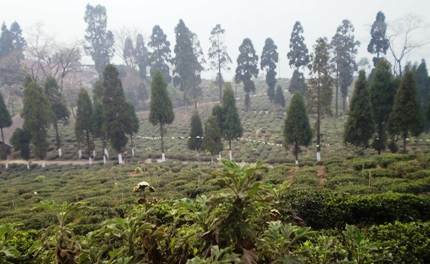 It's located at the fringe of Singell tea estate with beautiful views of the tea garden. 3) Short distance from the market area and station. 7-8 minutes drive. 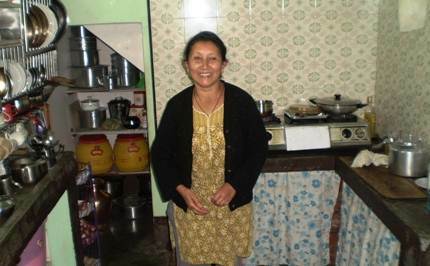 4) The Nepali family running the home stay is very cordial and friendly. You get an opportunity to mix with locals and get to understand their culture. 5) You get delicious home made Nepali food. 6) They will organize all local tours and transfers at reasonable rates. 7) Tour of the Singell tea estate and factory is an added bonus. Singell Home Stay has scenic beauty from balcony... unique tasty food.... very good and friendly behaviour. We will definitely visit again. We had a wonderful experience staying at Singell Homestay. Aruna and family went out of their way to make our stay comfortable and memorable. Right from picking us up from the train to taking special care of one our family members who felt sick; they looked after us really well. 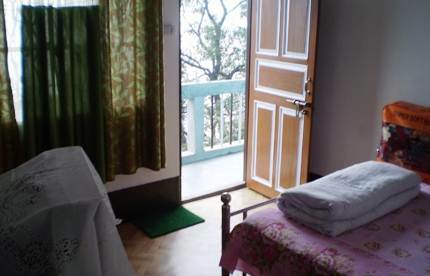 The rooms are simple and clean and have great views of the tea gardens. The entire family sat down to chat with us over some amazing home cooked food and we spent the entire evening together. We definitely have a new home waiting for us every time we visit Kurseong. Good food, Comfortable stay and Amazing people!!! It's being honour to stay in Singell Homestay, every one in this family is down to earth and very caring, n about food what to say !! Its so tasty n delicious. The view from the home is awesome (if you are nature loving), the rooms are well decorated. We were there for 3 days, If anybody plans a vacation near Darjeeling, stay at least 1 day at Singell homestay, Kurseong. Thanx Aruna Ma'am for making our stay so special that I can't express in words.. Thanks Aruna and family for a great time and wonderful hospitality at your home -- we truly enjoyed and felt well cared for, as well as enjoying the delicious food. It felt like you went the 'extra mile' for us and I'll gladly recommend your cozy Homestay to my friends. Especially enjoyed the private balcony, and rooftop sitting area from where we could see down to the river, across the stately tea gardens, and up to the high Himalayas - magnificent. And quiet spot! It was an amazing experience staying at the singell home stay. Everyone treated me like one of their own and we had a fantastic time staying there. Got to know a lot about their culture. The homestay is situated in a wonderful location from where we got the view of the toy train as well as the wonderful Singell tea garden. All the rooms were very nice and tidy & the food they cook was delicious. I loved my stay at Singell homestay. And looking forward to visit Kurseong again. I have stayed there from 17th to 19th Dec, it's truly home away from home. Thanks to all the family members for excellent stay there. Hope to visit again. Stayed at Singell home stay for three days in October 2016 and thoroughly enjoyed the stay with Aruna Pradhan and family. The homely stay was comfortable, simple and satisfying. This place is very nice for morning and evening walk in the nearby tea estate. The snow clad KANCHANJUNGA was visible in the morning sunlight and clear blue sky with naked eyes. Food served are simple in homely atmosphere. One can easily visit Darjeeling, Mirik and other nearby places without worrying too much. The quietness around the Home Stay leaves one a chance to be alone in ones thought. The clear sky in the night allows you to watch all stars and constellations absolute clarity, often not possible while staying in a city like Delhi/NOIDA. Thanks Aruna for making my stay comfortable. 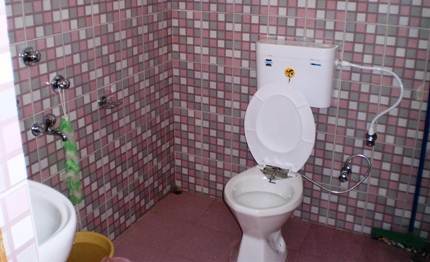 All the rooms are very clean and attached toilet specially. The room of the top floor is very well decorated with separate balcony. Behaviour of the family members are excellent and the quality of food is good too. Overall it is a peaceful and wonderful environment for couples and aged persons. All the family members are very helpful. People who like hustle-bustle all the time can ignore the place. Others should definitely stay there. I regret for not staying enough. Everything was good, the hospitality, the rooms & cleanliness, the food, the family members & not to forget the view from balcony. Rooms were very cozy, the food...aah...what to say? The family members were so helpful & friendly. If you want to plan or change your tour itinerary from there, simply ask Mrs. Aruna Pradhan. She will help you to decide because not only Darjeeling, there are lots of other places to go from there. 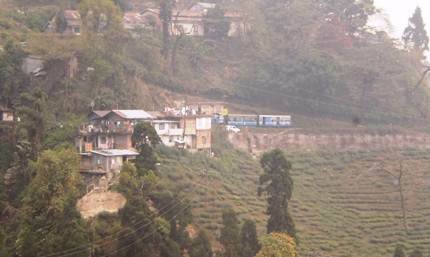 As for me, I would suggest to stay at Singell Homestay in Kurseong, take the toy train at 7.00 am to Darjeeling, roam around the whole day and again back to Kurseong on the same train in the evening. I would definitely like to go there again in future and spend a few more nights. Staying with the Pradhans at Singell Homestay was a wonderful experience. Right from when we reached Kuresong, they guided the local taxi on how to reach their place. It was as comfortable as staying at my own house. Great food (my wife got a chance to learn to make momos) and very clean rooms. The service of the tourist taxi was excellent, arranged by the Pradhans. Had a great time interacting with their entire family especially their son Adithya. Wishing them all the best. Singell Homestay is very well maintained a small but very clean home away from home. Everything from food to room service is just pefect. Aruna and her family are very good hosts. All the best to them for a successful future. Month of May - June is very hot in Kolkata. So we planned to spend a few days at Darjeeling Himalaya. After Chatakpur and Darjeeling we spent one day at Singell Home Stay, Kurseong. It is very clean, surrounded by lush green. Rooms are cozy and food is very good. The family who runs it is very nice. Hope in future, we visit again. My Mom and me landed on the Singell Homestay rooftop on the 12th of March 2015 and what a stay it was. With such a beautiful view from the room as well as the verandah we hardly wanted to go anywhere. Competing with the view was the hospitality of the Pradhan - Lama family, one has to specially mention Aruna here. Yummy local food and great company and not too pricey. Best place to stay if you are visiting Kurseong. Highly recommended. In the first week of January 2015 I went to Darjeeling for a holiday. On the way back we decided to stay in Kurseong for a day. I wanted to go to a hotel, while my wife wanted to go to a Homestay. I found Singell Homestay after searching in the internet. One call and the booking was done. We reached Kurseong by rail and they sent a car to pick us up. We reached in about 5 minutes. Right from the reception that they gave us to the final goodbye, it was such a wonderful experience. They have 3 rooms for guests, we took a double room. The family is amazing, we felt at home and became part of the family! And the best part was we made momos together! Yes! It was really nice to learn how to make momos. We loved the food, the service and the overall experience. Definitely a must stay for us every time we go to Kurseong. 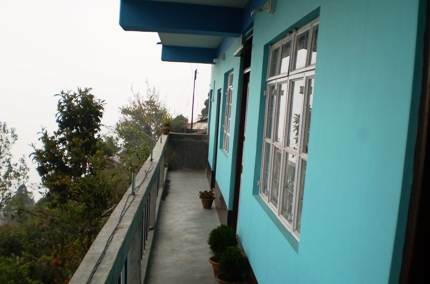 In fact we have decided to take a trip just to Kurseong next time and stay in Singell Homestay. It is the best holiday in the hills if you love a vacation in the lap of nature. We had been to Singell home stay on 17/18th Oct 2014 after a trek from Sandakphu. It was a great experience in terms of stay, food, price, location etc etc. Hats off to you. Very peaceful beautiful place for visiting. Try going for Singell Home stay. The people are very nice & helpful. There is a pet also. First of all thanks to your website to find singell. Location, atmosphere, behavior, cooperation & of course clean, calm & peaceful stay was excellent. Aruna & her family really work hard on this. All the best to them for their future & requested to please maintain this service & keep it up.